A customer recently invited me over to to see some of the upgrades they had been working on. They had purchased this home as a foreclosure auction, and needless to say, it had needed a little TLC. One of their first projects was renovating the kitchen (more on that full story to come)! 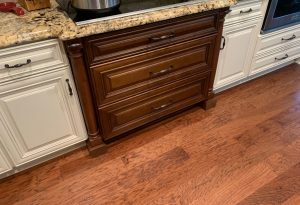 Their goal was to create a modern majestic kitchen and they were very on trend with their mixed cabinet colors, ogee edged granite counter tops, and HUGE eat-in island. However, one of my favorite upgrades they cleverly installed was a spice rack. Yes, you heard that right. I said one of my favorite things in their stunning kitchen remodel… is a spice rack. 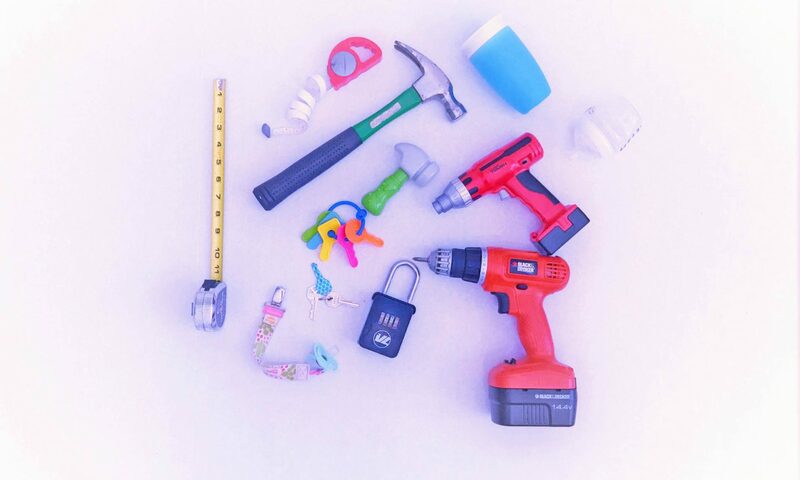 Not only is it practical but it’s completely incognito! From someone like myself who is an avid cook but who’s spice cabinet constantly looks like a toddler had been in there, this organized hidden gem was mind blowing! AND it fit in seamlessly with the rest of the cabinets! Cabinet covered spice rack pull outs when not in use. 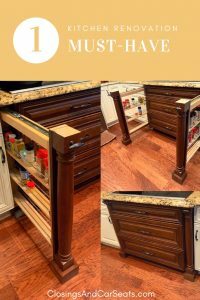 you or your contractors can install a similar cabinet filler pull out and optimize the otherwise useless filler space in your kitchen. Now, they can only be installed with new cabinet construction. This will not only ensure optimum fit but also allow your cabinet creatives to assist with picking out the perfect cabinet pillar/column/shell match. For a remodel like this one, the kit was perfect. 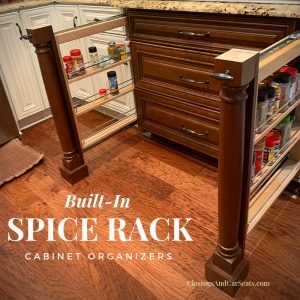 Cabinet covered spice rack pull out. 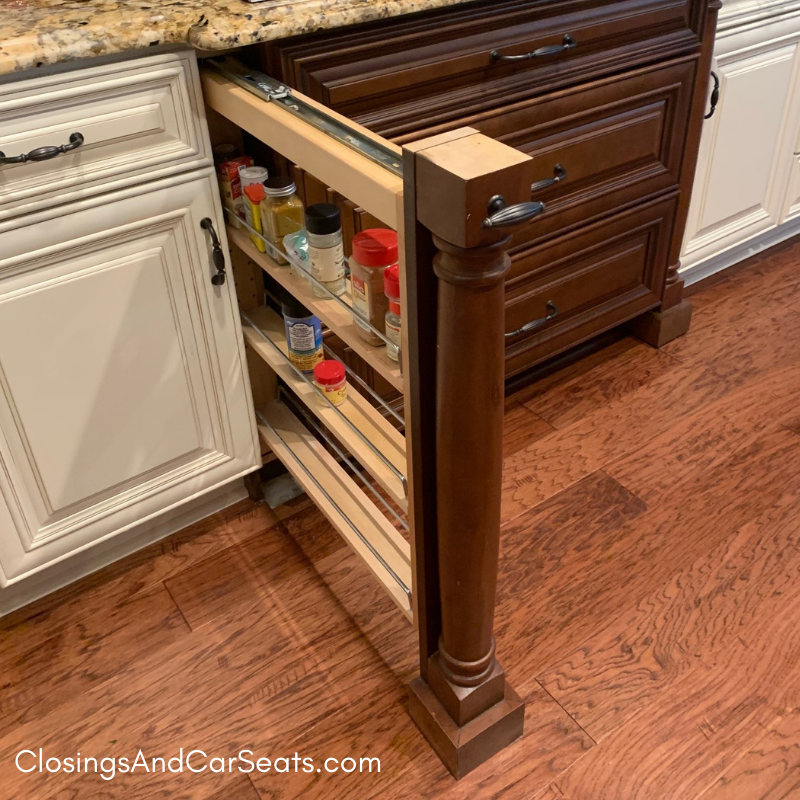 Add on that killer cabinet column cover with matching hardware and you’ve got a recipe for brilliance!